Mahendra Singh Dhoni is an Indian cricketer and former Captain of the Indian national cricket team; however, Mahendra Singh Dhoni captains the team only in limited-overs' format now. This spectacular and promising wicket-keeper/batsman lovingly called 'Mahi' filled in the much-awaited void in Team India's line-up, and since then has proved his worth. With his swashbuckling attitude and sporting a unique hairstyle, Mahendra Singh Dhoni has become a popular cricketer and marketing icon in India. Dhoni is an aggressive right-handed batsman and wicket-keeper, who took Indian cricket by storm with his unwavering confidence and sheer brute force. Mahendra Singh Dhoni is one of the very few Indian players who can profess to rival Sachin Tendulkar's popularity. Mahendra Singh Dhoni's ability to consistently hit the ball out of stadiums with his favourite Helicopter and Paddlesweep shots enthrals entire stadium as well as television viewers to a new frenzy. Mahendra Singh Dhoni, born on 7 July 1981 in Ranchi, Jharkhand to Pan Singh and Devaki Devi has an elder sister, Jayanti and brother Narendra Singh Dhoni. Originally his family belonged to Almora district of Uttarakhand. Mahendra Singh Dhoni studied at the DAV Jawahar Vidya Mandir School in Ranchi, Jharkhand. During his school days, Mahendra Singh Dhoni used to play badminton and football and in fact was the goalkeeper of his football team. Once, Mahendra Singh Dhoni was sent by his football coach to play cricket at a local cricket club. It was in this match that he impressed everyone with his wicket-keeping skills which resulted in getting him a regular post of the wicketkeeper at the Commando Cricket Club. In fact, Dhoni focused on cricket after his 10th standard. From 2001 to 2003, Mahendra Singh Dhoni worked as a Train Ticket Examiner (TTE) at the Kharagpur Railway Station under South Eastern Railway in Midnapore (W). Mahendra Singh Dhoni married Sakshi Singh Rawat on 4 July 2010. The couple is blessed with a daughter, Ziva who was born on 6 February 2015. Mahendra Singh Dhoni began his career in 1998 by playing for Bihar U-19 team. Mahendra Singh Dhoni also played for East Zone U-19 team. In 1999-2000, he made a debut for Bihar in Ranji Trophy. Dhoni's brilliant performances in the Deodhar Trophy, Duleep Trophy and India 'A' tour of Kenya, brought him to the notice of the national team selectors. Mahendra Singh Dhoni was then selected to play for the Indian Cricket team in 2004, where dhoni made his ODI debut against Bangladesh in Chittagong. This legend grew to another level when under his captaincy India won in the inaugural ICC World T20 in 2007; and bagging the Border-Gavaskar Trophy in 2008 and 2010 against Australia. Again, in 2011, he led the team to win the World Cup in the 50-overs format followed by the Champions Trophy in 2013; taking Dhoni's Test and ODI captaincy records to be 'the best till date' among all the Indian captains. Mahendra Singh Dhoni has come a long way in cricket since with his sterling performances he has rescued India from many a tight positions. During his illustrious career, Mahendra Singh Dhoni has played 90 Tests scoring 4876 runs with his highest being 224 against Australia at Chennai in 2013. His amazing wicket=keeping statistics include 256 catches and 38 stumping. Mahendra Singh Dhoni has so far played 265 ODI matches scoring 8620 runs, with a staggering 183 not-out as his highest score against Sri Lanka, in Jaipur in 2005-06. Mahendra Singh Dhoni ODI wicket-keeping statistics include 246 catches and 85 stumping. Mahendra Singh Dhoni also captained the Chennai Super Kings Team in the Indian Premier League (IPL) matches. Under his captaincy, the team won two IPL titles as well as the Champions League Twenty20 in 2010. On many occasions, Mahendra Singh Dhoni received the Man of the Series and the Man of the Match Awards; with his first Man of the Match Award in Test series in 2008 against Australia. With Sri Lanka playing ODI Series in India in 2005-06 Mahendra Singh Dhoni was awarded the Man of the Series for the first time. 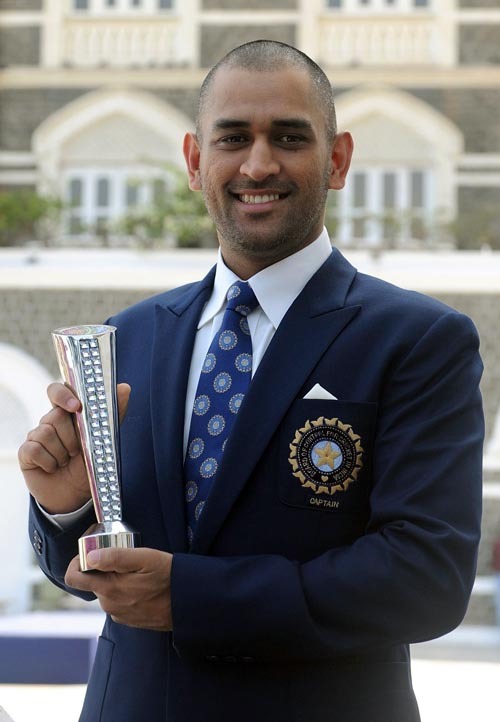 For two consecutive years; in 2008 and 2009, Mahendra Singh Dhoni was a recipient of the ICC Player of the year award. The Rajiv Gandhi Khel Ratna award (2007) and the Padma Shri was bestowed on him in 2009. Mahendra Singh Dhoni announced his retirement from International Test Cricket on 30 December 2014 after the test between India and Australia in Melbourne was a 'Draw'. The reason behind his immediate retirement, Mahendra Singh Dhoni said was the strain of playing cricket in too many formats. wished to concentrate better on ODIs and T-20 matches. However, on 04 January 2017, Mahendra Singh Dhoni stepped down from the position of captain of the Indian ODI and T20I cricket teams, though reportedly Mahendra Singh Dhoni informed the board about his availability for selection for the upcoming series against England. Mahendra Singh Dhoni's 10 sixes in an innings are the sixth highest in ODI cricket. Mahendra Singh Dhoni broke the record of Adam Gilchrist for the highest score made by a wicket keeper by scoring 183 runs. Mahendra Singh Dhoni holds the record of maximum dismissals by an Indian wicketkeeper in an innings. Mahendra Singh Dhoni is the only ODI captain to have played at number seven and scored a century. He did it in December 2012 while playing against Pakistan. Mahendra Singh Dhoni is the first Indian wicketkeeper to reach 4000 tests runs. Mahendra Singh Dhoni remained captain of the ICC World XI five times in a row. Under Dhoni's captaincy, after a gap of more than 20 years, India became the first team to whitewash Australia in a Test series. In 2009, M S Dhoni topped the list of the world's top 10 earning cricketers as per report compiled by Forbes. According to the Forbes Highest Paid Athletes list for the year 2012, Dhoni ranked as the 31st richest sportsman in the world.